Each vial contains meropenem trihydrate equivalent to 500 mg anhydrous meropenem. Each vial contains meropenem trihydrate equivalent to 1 g anhydrous meropenem. Each 500 mg vial contains 104 mg sodium carbonate which equates to approximately 2.0 mEq of sodium (approximately 45 mg). Each 1 g vial contains 208 mg sodium carbonate which equates to approximately 4.0 mEq of sodium (approximately 90 mg). • Pneumonia, including community acquired pneumonia and nosocomial pneumonia. Meronem may be used in the management of neutropenic patients with fever that is suspected to be due to a bacterial infection. The dose of meropenem administered and the duration of treatment should take into account the type of infection to be treated, including its severity, and the clinical response. A dose of up to 2 g three times daily in adults and adolescents and a dose of up to 40 mg/kg three times daily in children may be particularly appropriate when treating some types of infections, such as nosocomial infections due to Pseudomonas aeruginosa or Acinetobacter spp. Pneumonia including community-acquired pneumonia and nosocomial pneumonia. 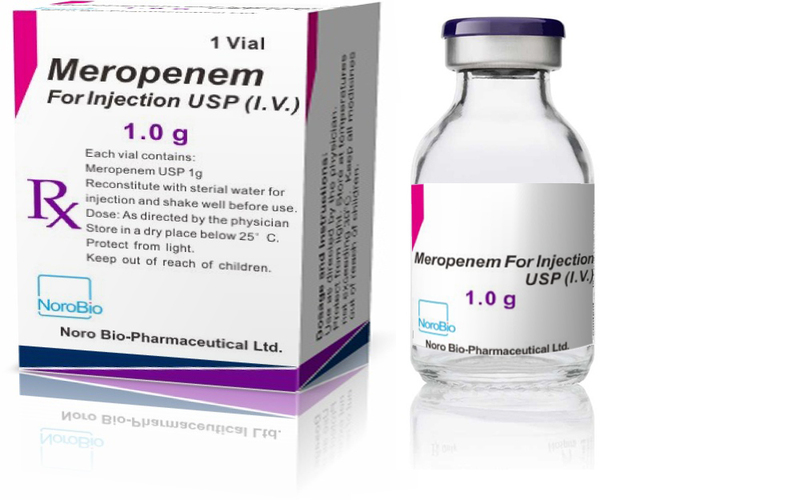 Meropenem is usually given by intravenous infusion over approximately 15 to 30 minutes. The dose for adults and adolescents should be adjusted when creatinine clearance is less than 51 ml/min, as shown below. There are limited data to support the application of these dose adjustments for a unit dose of 2 g.
Meropenem is cleared by haemodialysis and haemofiltration. The required dose should be administered after completion of the haemodialysis cycle. No dose adjustment is necessary in patients with hepatic impairment. The safety and efficacy of meropenem in children under 3 months of age have not been established and the optimal dose regimen has not been identified. However, limited pharmacokinetic data suggest that 20 mg/kg every 8 hours may be an appropriate regimen. Meropenem is usually given by intravenous infusion over approximately 15 to 30 minutes. Alternatively, meropenem doses of up to 20 mg/kg may be given as an intravenous bolus over approximately 5 minutes. There are limited safety data available to support the administration of a 40 mg/kg dose in children as an intravenous bolus injection.